Samoa narrowly overcame USA in their World Cup Pool B encounter in Brighton, as the Americans were eventually punished for their ill discipline. The Eagles gave away a succession of penalties at the breakdown as Samoa dominated possession, allowing Tusi Pisi to kick 12 points. Tim Nanai-Williams and Ofisa Treviranus crossed for the Pacific Islanders either side of half-time. Chris Wyles and Chris Baumann touched down in reply, but Samoa held firm. Samoa are looking to reach the quarter-finals for the first time since 1995 and face South Africa in their next pool match next Saturday. 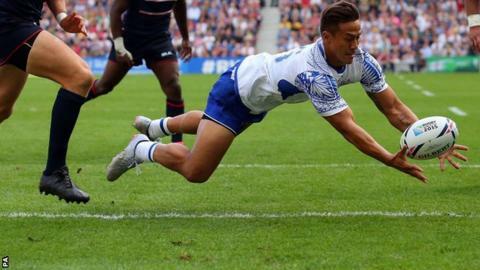 Samoa took the lead through an early penalty from Pisi and the fly-half was influential in their first try, showing great vision to send a measured grubber kick through to Nanai-Williams to touch down in the corner midway through the first half. The Eagles lacked fluency in their game but, after another Pisi penalty, their backs showed flashes of what they are capable of when a break from AJ MacGinty and great hands from Seamus Kelly allowed Wyles to score. As well as their high penalty county, the Eagles' execution at the line-out was also found wanting, with several throw-ins not straight. Samoa had won all of their four previous Tests against the USA and Stephen Betham's side controlled both territory and possession after the break as the Eagles continued to give away penalties. Pisi was crucial again in their second try, when another clever kick behind the USA defence was fumbled by Takudzwa Ngwenya and Treviranus eventually picked up the pieces to score. MacGinty brought the Eagles back into the game but another Samoan penalty, kicked by Michael Stanley, allowed the team from the Pacific islands a cushion to see out the game despite Baumann crashing over in the closing stages. Samoa now face a wounded Springboks side in Birmingham, but with Pool B wide open after Japan's stunning victory over the two-time champions on Saturday, USA will still hold hopes of reaching the last eight for the first time. They face Scotland in Leeds next Sunday. Samoa coach Stephen Betham: "We were hoping it would be more convincing but it was scrappy, we forced too many 50-50 passes, but we'll take the win and move on from here. "The errors made the game hard for us and we have a lot of tidying up to do before next weekend. "But at least our discipline was good. We kept 15 players on the park for the first time in a while and if we continue to keep 15 players on the park we will have a chance." USA coach Mike Tolkin: "With the Pool being wide open after Saturday those bonus points could be important so it was disappointing not to take it. "But there are positives. Chris Wyles' try was outstanding and we were on the front foot a lot. We need to capitalise on that. "Can we still make the quarter-finals? Absolutely. But we need to be more disciplined first and foremost. Our scrum and line-out weren't operating so efficiently and we want to iron that out." Samoa have won their tournament opener on six of seven occasions. In contrast, the Eagles have not won their opening fixture at a World Cup since 1987. The nine point difference between the two sides was the biggest winning margin in a game between these sides; the previous four games had all been won by seven points or fewer. Samoa have scored 20+ points in each of their last five games, a run that began with a win against the USA (W3 D1 L1). Samoa: Tim Nanai-Williams; Ken Pisi, Paul Perez, Reynold Lee-Lo (Mike Stanley 1), Alesana Tuilagi (Fa'atoina Autagavaia 72); Tusi Pisi, Kahn Fotuali'i; Ofisa Treviranus (capt), Jack Lam, Maurie Fa'asavalu (Alafoti Fa'osiliva 50); Iosefa Tekori, Teofilo Paulo; Anthony Perenise (Census Johnston 50), Ole Avei (Motu Matu'u 65), Sakaria Taulafo. Replacements: Viliamu Afatia, Faifili Levave, Vavao Afemai. United States: Blaine Scully (Brett Thompson 50); Takudzwa Ngwenya, Seamus Kelly, Thretton Palamo, Chris Wyles (capt); AJ MacGinty, Mike Petri; Samu Manoa, Andrew Durutalo, Al McFarland; Greg Peterson (Daniel Barrett 57), Hayden Smith (Cameron Dolan 50); Titi Lamositele (Chris Baumann 70), Zach Fenoglio (Phillip Thiel 50), Eric Fry (Oli Kilifi 70). Replacements: Shalom Suniula, Folau Niua.